No less a person than the old Joseph Haydn praised with these words Jan Ladislav Dussek after having seen him in London in 1792, where Dussek worked as a composer and performer. 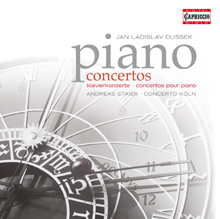 At his concerts Dussek presented mostly compositions written by himself; among them often one of his nearly twenty piano concertos or one of his numerous piano sonatas. During his London time he struck up a friendship with the piano-builder John Broadwood. This association between the composer-pianist and the master-craftsman was a very fruitful one and Dussek convinced the renowned London piano maker to extend the key ambitus of his instruments by adding another octaves. well accompanied by the famous Ensemble CONCERTO KÖLN.